A little conversation between my friend couple, one is Canadian, the other half Japanese, half Chinese. I remember chrysanthemum has a green, faintly light floral scent. Every Chinese New Year my mom would buy some, of course, never white, together with gladiolus and cherry blossom branches and put them in a big vase. It’s a really strange bouquet because it doesn’t give off any aromas except when the vase water turns bad. To my mom, buying cut flowers for Chinese Years is really a traditional thing, almost like an annual homework exercise; our home never has any cut flowers for any other occasions. She stopped the ritual 15 years ago when she was no longer capable of going to the flower market and grocery shopping all by herself. I had had fond memories of Chinese New Years with my family when I was younger, the only time all I needed to care for in life was school grades. Now that I have spent more than half of my life living in Canada, the smell of chrysanthemums becomes a memory trigger of good old days of a spoiled kid. Serge Lutens’ De Profundis (From the Deep) boasts that it’s a chrysanthemum soliflore perfume, and that really gets my attention. When a bottle appeared on eBay at a good price, I blind-bought it. I knew it had got rave reviews, but I was always a bit skeptical when it comes to Serge Lutens perfumes. 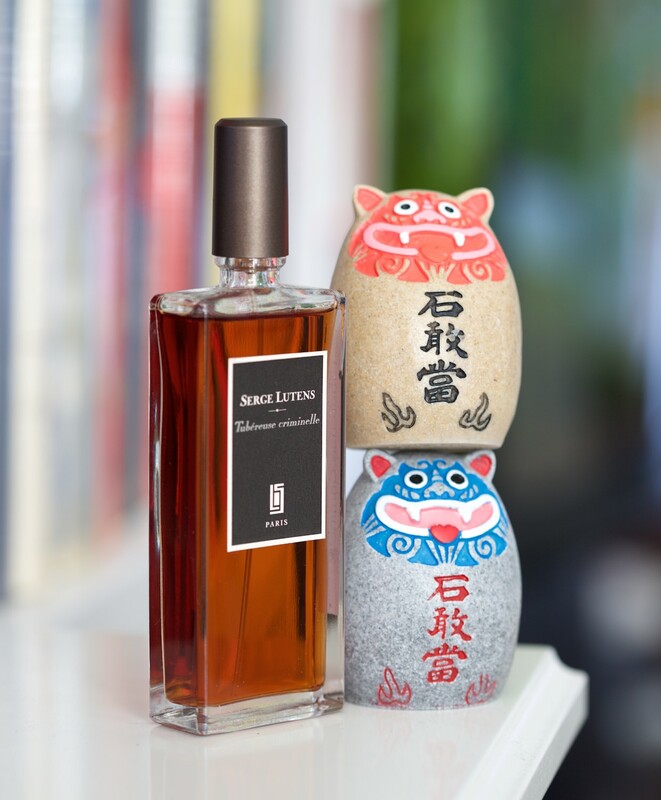 I own a bottle of Datura Noir, also by Serge Lutens, which is supposed to smell of datura flowers (which I have never seen or smelled one before) – it smells nice, but to me it’s a vanilla oriental perfume, not a floral perfume. But De Profundis delivers. When I first smell it, my mind whispers “wow”. The perfume manages to recreate the ghostly greenness of fresh chrysanthemum flowers, the symbol of death and lamentation, very vividly that it’s a bit startling. I almost forget to appreciate the note development that follows when the “chrysanthemum” top note withers away and new life begins to push out of the soil notes with plumy/peony/woody sweetness. A sentimental perfume for the introverts, a light floral scent for the melancholics. I don’t know why this tidbit of news that I read from a newspaper gets stuck in my head for almost 30 years: an art teacher takes his class to the museum that is showing an all-red minimalist painting to “protest”; he asks his students to paint their own all-red painting at the museum to mock the museum curator, why he would consider such a simple single-colour painting worthy of exhibition. I knew what the teacher was thinking – the artist pushed his luck with a piece of “art” that probably didn’t take him much effort to create and he succeeded, while all the excellent artwork that took “better” artists years to create didn’t get the admiration they deserved. I think my first reaction when I smelled Serge Luten’s L’orpheline was probably the same as that art teacher’s – “What? Uncle Serge, you think you can get away with a simple two-note perfume? (Incense and ISO E Super)” However, after wearing and smelling it for a while, I start to get it… it is quite beautiful, elegant and poignant, and there are subtleties in its simplicity. Maybe that’s why it’s called “The Orphan?” – you are born unprivileged, and you have to work very hard with the very little that you have to impress and achieve, and the admiration from others all goes to the perseverance and the struggling, not the work the orphan has accomplished? Well, a red painting is still a red painting, I can only give the artist credit for designing a mood and an awe, but the appreciation of the artwork, to me at least, is limited, and cannot be compared to, say, The Coronation of Napoleon. 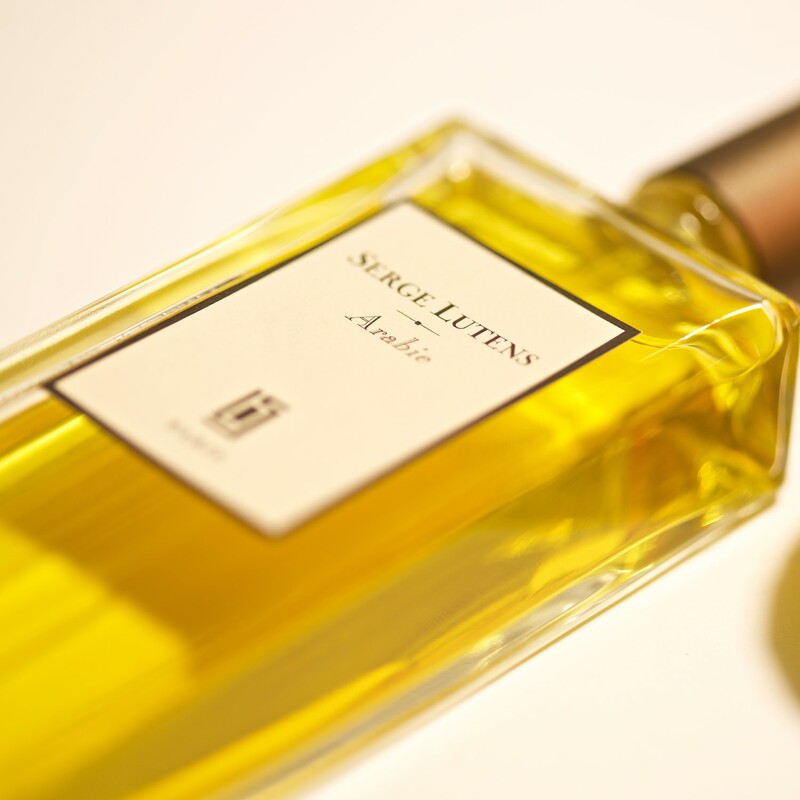 I wonder, if it was not Serge Lutens who released this perfume but a new start up perfume company, would it get the same reception? If you watch Captain Arabie The Movie in reverse, you see the chamber door closes on the super buffed-up and half-naked Captain Arabie, the machine starts sucking the golden juice out of his body, passes through the body odour enhancement system, and the essence goes into a flat and thin rectangular serum bottle. The mad doctors, Serge Lutens and Christopher Sheldrake then take it out from from the system and walk backwards out of the lab with a goofy look. As you know, Captain Arabie really likes curry, he spreads curry Nutella on toast for breakfast, eats curry chicken for lunch and curry lamb for dinner. He fights his enemies with his famous headlock, but really, he doesn’t need to flex his arm, the B.O. from his armpits can kill most weaker enemies in the room and who can survive when your nose is so close to his odour emitting glands in a headlock situation. Serge Luten’s Captain Arabie, or simply, Arabie, is the essence of our super hero except the B.O. has been filtered out. Every time I look at the perfume, the sparking yellow juice reminds me of the curry-infused oil that floats to the top of my curry chicken dutch oven pot. This golden juice, is so sweet (amber, dried fruits, figs, dates), spicy (cloves, caraway, nutmeg), aromatic (sandalwood, benzoin, myrrh) and beautiful, it’s irresistible. But please, don’t wear it when you have a body odour problem, because you will become Captain Arabie and you don’t want to kill anyone by entering a non-ventilated conference room on a hot day. While lining up to pay at a Toronto Korean grocery store, a caucasian woman in the shop suddenly screamed, “No, you can’t do this! This is poisonous!” Everyone turned around to see what happened, but all I saw was an old man mopping the floor. “No, you can’t mix bleach with other cleaning products! It creates toxic fumes and they will kill you!” The woman pointed at the bucket as she spoke very nervously. Compared to Christopher Sheldrake’s Tubereuse Criminelle where he poured gasoline into a tuberose perfume and called it a crime, Tubereuse Criminelle is a much less deadlier concoction. If you can mentally subtract the gasoline notes or Vicks Vapour Rub smell from this perfume, you have a very beautiful tuberose perfume. 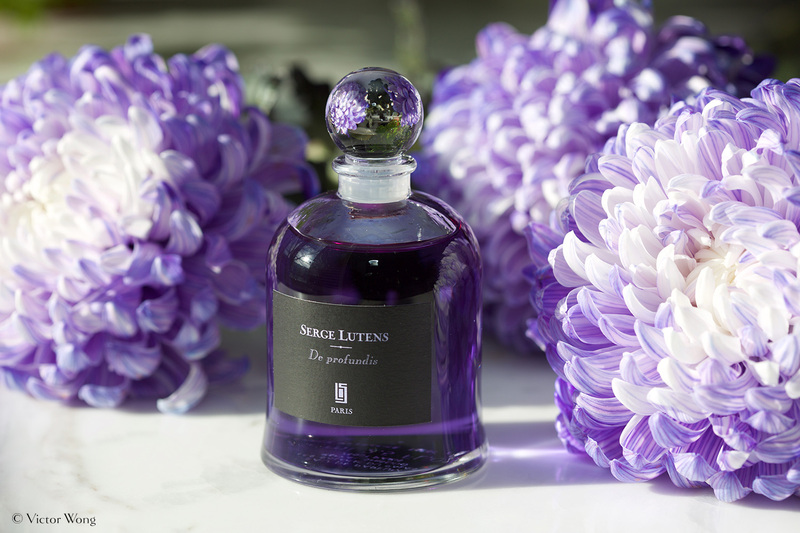 He really didn’t have to put those unusual notes in the perfume because before he had created a perfume for Serge Lutens called A La Nuit, a relatively simple perfume that was all about jasmine and it worked. I guess as an artist you have to constantly push people’s buttons and challenge yourself; if you have been painting flowers for years it’s fun to paint a gas station explosion scene where a woman wearing shades and a white Chinese gown walks slowly towards the camera. Serge Luten’s line of perfumes, to me, is like a spectrum of very ambiguous colours, like periwinkle, salmon, or turquoise; I can’t exactly tell whether it belongs to the blue colour group or the red colour group, and that often frustrates me. (Similarly, go to any clothing outlet shop and you will see those on sale are mostly of “weird” colours that are really hard to pull off.) As my female coworker once pointed out, some Serge Lutens perfumes smelled nice, but “incomplete” to her. 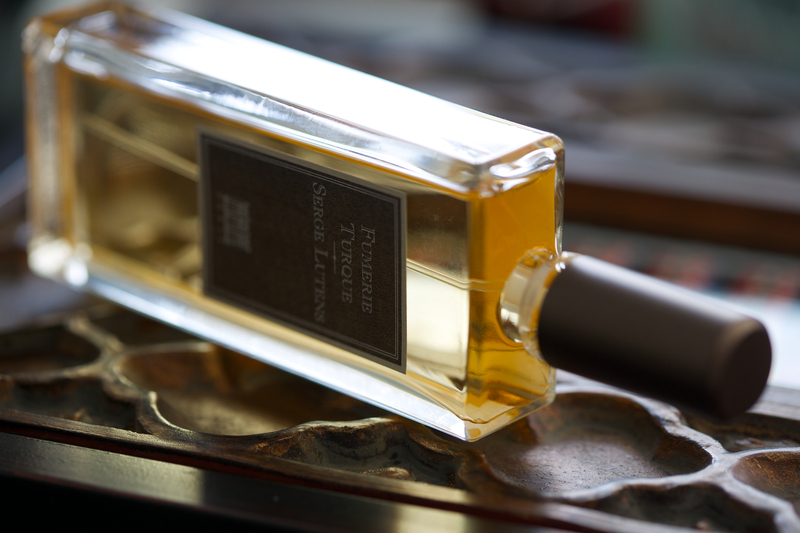 Then came Serge Luten’s Fumerie Turque (Turkish Smoke House) that made me bury my head in my arms to smell it at work. This one has a distinct colour and it’s deep brown. When I wear it, I feel like I have been invited to a dimly lit tent constructed with animal hides. I am sitting on the ground, and two-foot away from me also sits the chief. He is smoking a rustic-looking cigar that he made himself. The fume that permeates the tent is rich and honey-sweet. With nothing in common between me and him, I comment on the unusual shape of his cigar and he said, “Yes, I’ve put some Toblerone chocolate in it”, then he scratches his balls and hands me that cigar with that same sweaty hand, “have some of this”, he says. My friend told me that I smelled wonderful today. 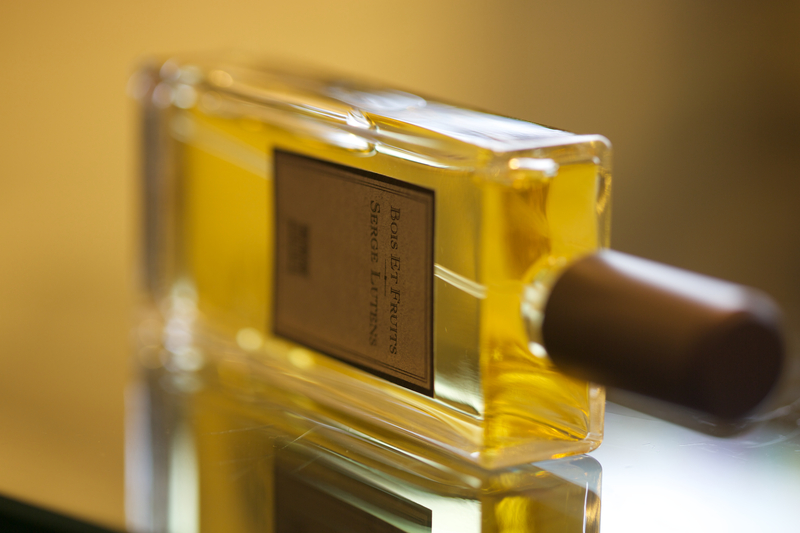 I was wearing Serge Lutens Bois De Violette (1992), a perfume that got a 5-star rating from Luca Turin. It’s good to receive a compliment, but I was hesitant to say “thank you” from the bottom of my heart. I only got this perfume recently and I had not worn it enough to understand why it got such great rating. Frankly, I am disappointed with Bois De Violette. 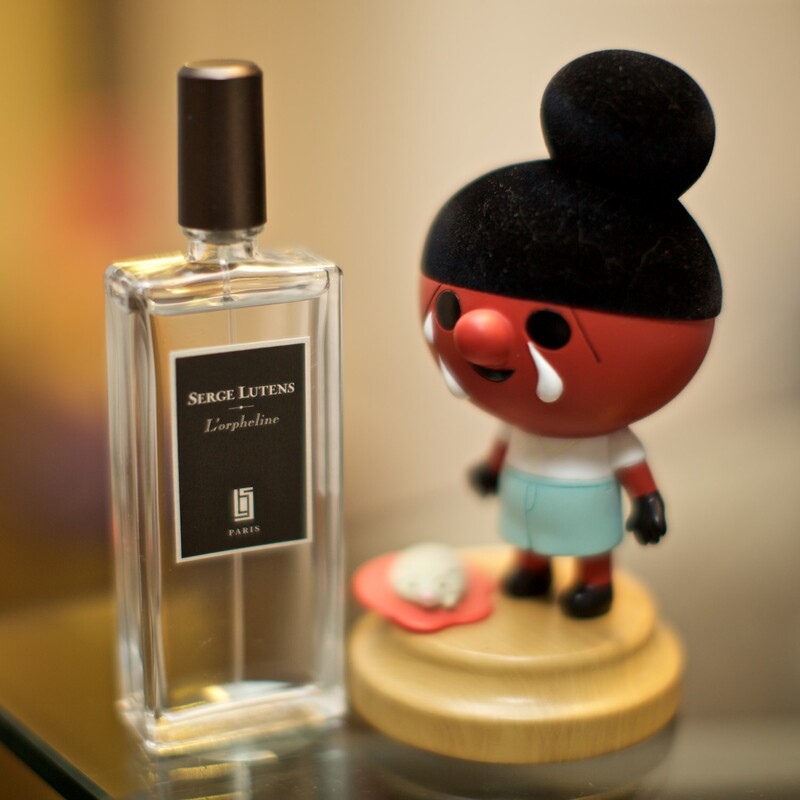 (I can see some red dots on my forehead… die-hard Serge Lutens fans, please, lower your infrared-aiming rifles, I can explain.) You see, it’s only recently that Toronto’s Sephora has started carrying some of the 50ml flat rectangular Serge Lutens bottles. I visit that shop very often and I can say I know the line very well. Frustratingly, they don’t carry the ones that I am most interested in. (The ones that Luca gave 5 stars. Serge, why did you do this to me?) 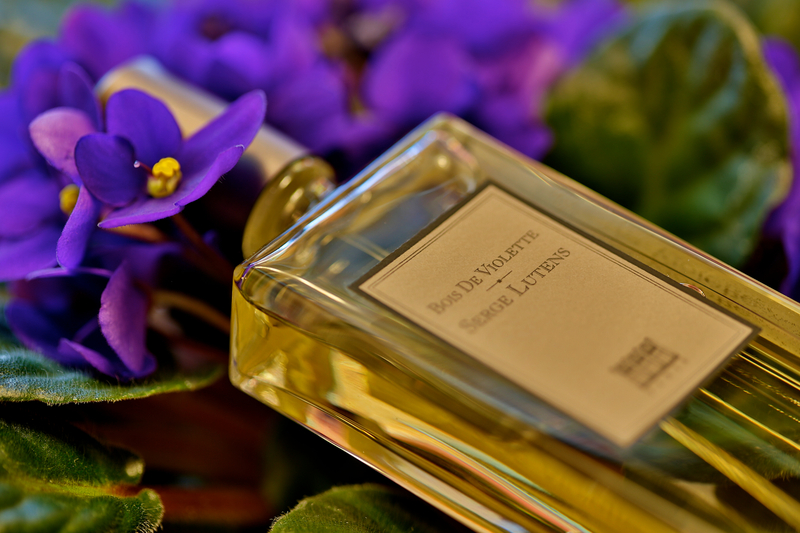 Eventually, I ordered Bois De Violette online, and I was hopeful that it would smell amazing. The perfume arrived, and to my shock, it smelled almost like Bois et Fruits, Feminite do Bois and Arabie, only it has violet in it instead. I was expecting something awesome like a slice of cheesecake, after eating cranberry muffins my whole life, but all I got was a 5-star blueberry muffin. Well, life goes on. On the menu of Serge Lutens’ Oriental Cafe, there were quite a few of desserts for you to choose from. Most people ordered “Borneo 1834”, “Chegui”, and “Five O’Clock Au Gingembre” but on the bottom of the list there’s one called “Bois et Fruits”. I was curious and ordered one. The waiter brought it out in a beautiful bowl with an Arabic motif. The dessert smelled like a fruit cake, but the fruits were of not the typical kind – plums, figs, peaches and apricots. What’s also unusual was spices that they used; I could smell nutmeg and cloves. The strangest part was the topping – the waiter asked if I wanted some, but really he didn’t expect me to say no, and he started grinding his mill. I looked down on my bowl, and to my horror I saw a bunch of pencil shavings. “Trust me, it’s good,” he said.